FEATURED RECIPE: WATERMELLO DESSERT - What About Watermelon? If you’re anything like me, dessert is the most important meal of the day. For fellow dessert enthusiasts, the holidays are the focal point of all food sweet, sugary and delicious. But when it comes to the right dessert to end your holiday feast, the possibilities are virtually endless: pumpkin pie, cheesecake, truffles, fruitcake and mountains of Christmas cookies. Before I get too hungry from naming off those delicious holiday favorites, here’s my suggestion: ditch the fruitcake and enjoy some Watermello Dessert! In a large bowl, dissolve lime gelatin in three cups boiling water. Pour into an 8-in. square dish coated with cooking spray. In another large bowl, combine watermelon and strawberry gelatins; stir in the remaining boiling water until gelatin is dissolved. Pour into another 8-in. square dish coated with cooking spray. Refrigerate both dishes until gelatin is very firm. Meanwhile, sprinkle unflavored gelatin over cold water; let stand for one minute. In a small saucepan, bring grape juice to a boil; stir in softened unflavored gelatin. Stir over low heat until gelatin is dissolved. Pour into a large bowl; refrigerate for 45 minutes or until slightly thickened. Gently fold in two cups whipped topping. Cut green gelatin into ½-in. cubes and red gelatin into 1-in. cubes. Place two cups whipped topping mixture in a large bowl; fold in green gelatin. Spread into a 13-in. x 9-in. dish coated with cooking spray. 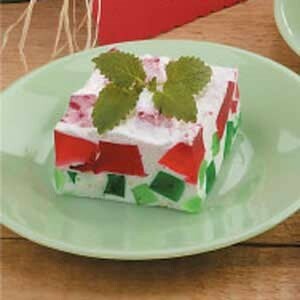 Fold red gelatin into remaining whipped topping; spread over green gelatin layer. Refrigerate for two hours or until set. Cut into squares and serve!